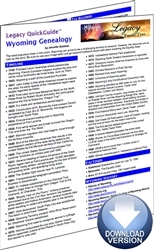 Available as a PDF download, these research guides can assist your family history journey, and can be accessed on your computer or mobile device for anytime access! Guides include historical timelines, tips on specific research strategies, links to websites and resources covering vital records, church records, census records and general resources. The guides range from four to five pages each. The following guides were written by Jen Baldwin, and are available for purchase via the Legacy Family Tree Store, for only $2.95 each!